Global commodity prices, via the Thomson Reuters Core Commodity Index – continue to flirt with an 85-yr support line dating back to 1933. The line’s origin dates back to 1933 when FDR ended the gold standard via E.O. 6102, thereby devaluing the USD in an attempt to raise nominal prices and end the Great Depression. Indeed, one can see that prior to this, the index’s break below ~15-yr support in late 1929, and the collapse in commodity prices that followed over the next three years, coincided with the Great Depression. Thereafter, the line’s next touch point runs through the early 1940s when commodities began a major, WW2-induced rally. Thereafter it passes through 1971 when Nixon ended gold convertibility amid soaring Vietnam-era deficits. The most recent flirtation I referenced has been over the past three years, 2016-2019, amid generalized global commodity weakness, initially and conspicuously driven by the mid-2014-early-2016 crash in crude oil amid the Obama admin’s concerted effort to wage financial warfare against Russia. If one’s view is sufficiently long-term, it becomes easier to understand Powell’s historic and perhaps, many would argue, ignominious reversal to calling inflation “one of the major challenges of our time,’’ from “auto-pilot” balance sheet quantitative tightening just a few months ago. 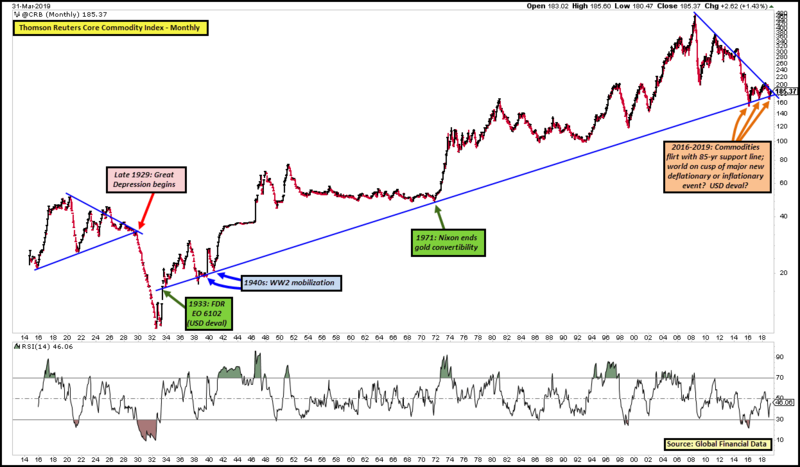 ← Goldilocks 1950s-1960s Emerging as Most Likely Outcome for US Stocks?